Virtual Offices Start at Only $59/Month! 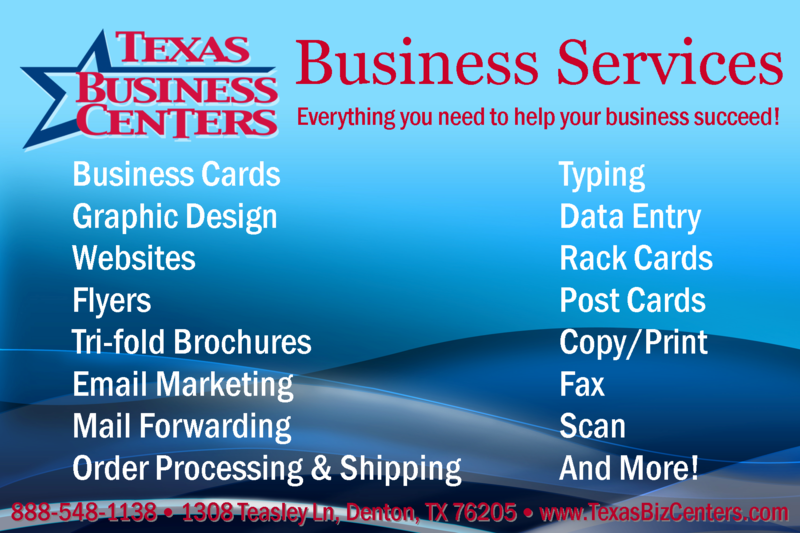 Texas Business Centers Offers a Variety of Business Services to Help Any Small Business Succeed! 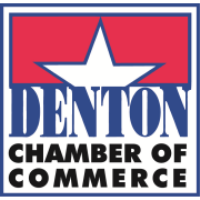 Since 2010, Texas Business Centers is Denton’s first and premier plug and play office solution! Texas Business Centers offers month to month leases on one to two person offices for small business owners and professionals. TBC also offers virtual office solutions for home based businesses to give them a place to meet clients, receive mail and an address to advertise on business cards, websites, and other marketing materials. Texas Business Centers is focused on helping the entrepreneur or small business owner overcome obstacles such as high overhead, limited access to inexpensive graphic designers, and the feeling of doing things alone. TBC has made being a small business owner much easier with low cost office solutions, affordable business services and networking events designed to bring small business owners together. 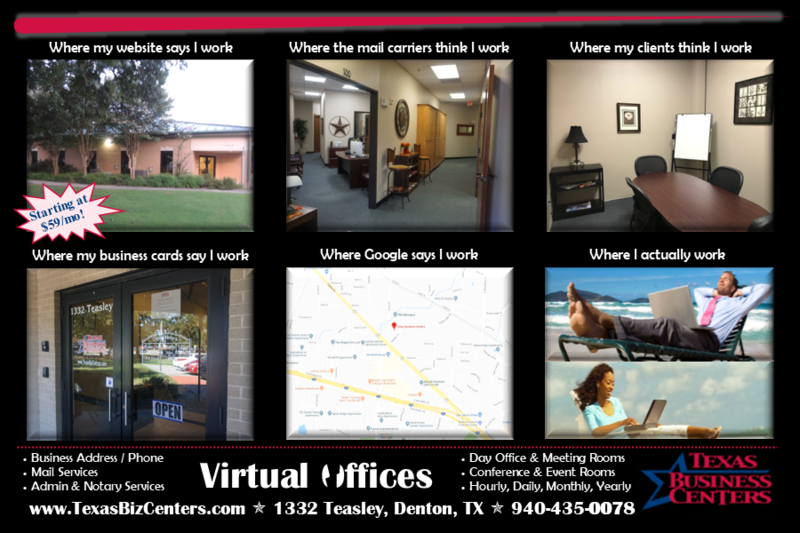 Texas Business Centers is the only executive office center in Denton to offer the virtual office package which gives tenants a professional mailing address, a Denton phone number and a place to meet clients without having to keep an office full time. TBC also offers month to month leases to keep business owners’ minds at ease and do not charge extra for the perk. The staff at TBC is par none when it comes to customer service, skills and going above and beyond. The truly unique vibe of Texas Business Centers comes only from the wonderful tenants from diverse fields and backgrounds. Lawyers, financial advisors, and marketing and promotion companies work alongside a massage therapist, a solar screen company, consultants, and contractors. 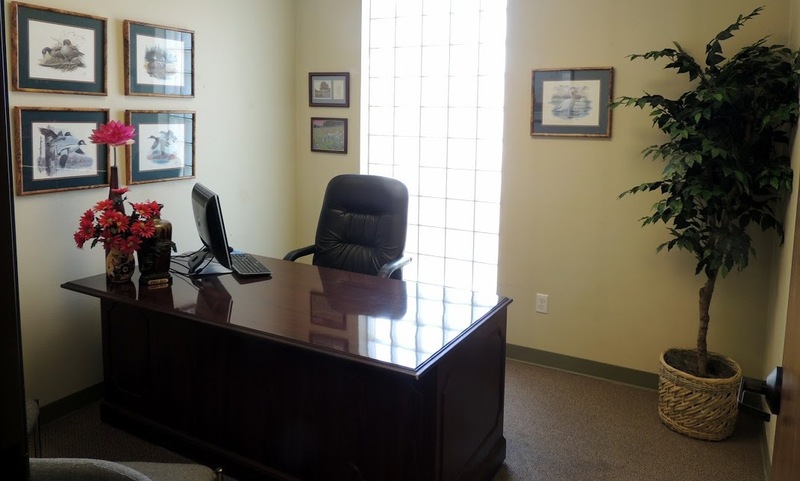 Every tenant is professional, courteous and happy to be at Texas Business Centers! To help businesses succeed by providing affordable and convenient office solutions and business services. To that end we will always be available to the start up and small business community, assisting in the growth and development of local economies for many years to come. We contract with the best service providers around to provide economical yet professional service options to help each small business owner meet their goals. Hours of operation are 9am to 5pm M-F with optional availability after hours and on weekends. 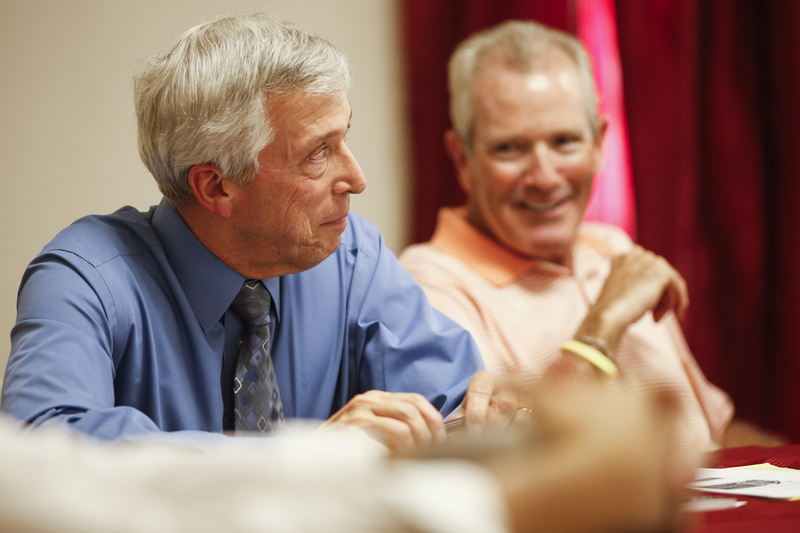 What type of businesses could benefit from using Texas Business Centers? 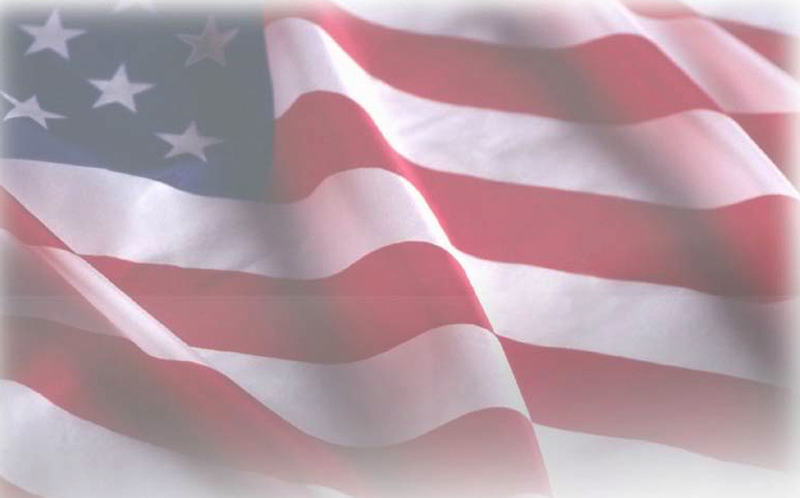 Texas Business Centers offers a full range of business services for the entrepreneur! 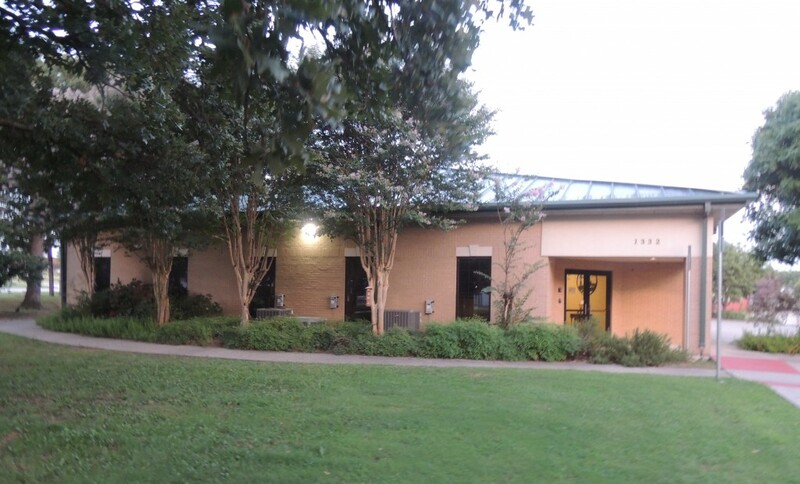 We have conference rooms, offices, training rooms and more for rent by the hour, half day, day or week! 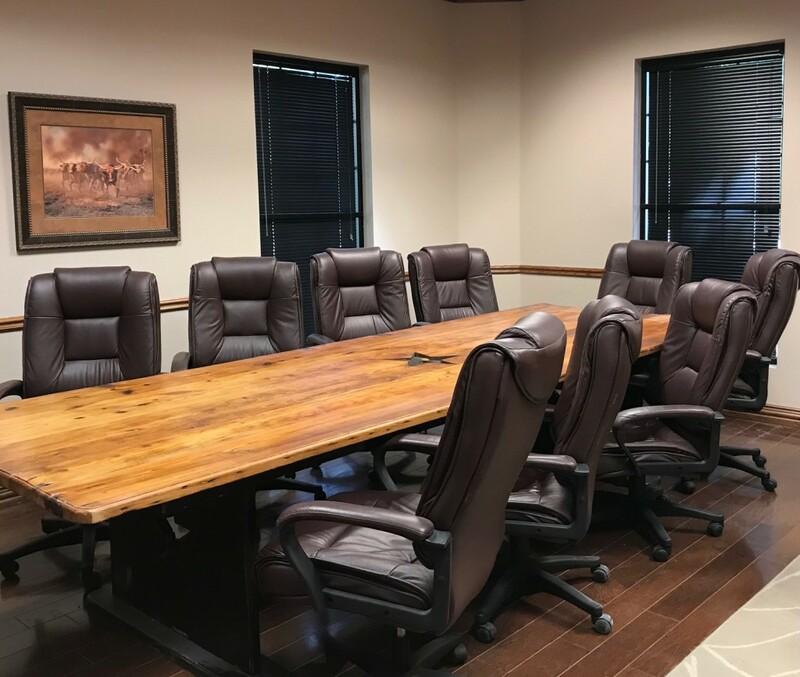 Texas Business Centers established The Boardroom (think Shark Tank but much more educational and user-friendly) to help business owners network and grow.